There was a time when buying an affordable phone would mean considerable compromise. Increasingly, however, the boundaries between mid-range and true flagship devices is being blurred, to such an extent that sometimes the more affordable phone can actually be the better option. Case in point is the Honor 9: this ultra-shiny mid-ranger, which costs £380, is a better buy than the Huawei P10 - largely because its screen doesn't suffer the same smeary issues of its Huawei bigger brother. Which is bonkers, given Huawei makes both of these devices - Honor is an offshoot brand - and the P10 is far pricier. Then there's the competition: with OnePlus seemingly shying away from the once affordable space, it's really opened the door for the Honor 9 to shine. And not just shine because of its swanky reflective blue coat; shine because this is the phone that - after a number of iterations - gets almost everything right. Indeed, there might be no better mid-range option on the market today. The Honor 9 is this year's refresh of the range, so no surprise that it looks a lot like last year's Honor 8. 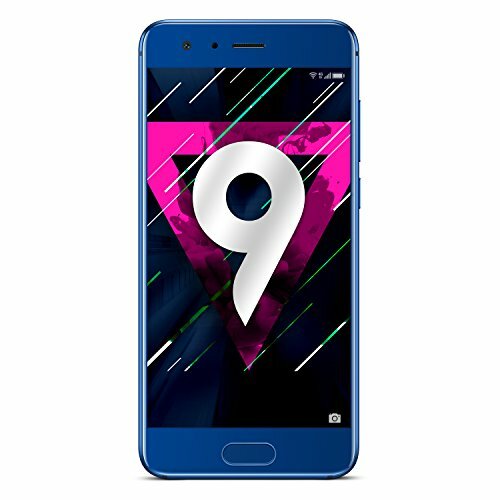 Which is a great thing: the eye-catching blue colour is distinctive compared to almost all other phones, bar the HTC U11 and its various two-tone finishes. Sure, the Honor's multi-layered coating is a fingerprint magnet and can scratch quite easily, too, but keep it looking pristine and it's a gorgeous slab of tech that will have onlookers asking about it. Or choose grey, black or gold if you prefer. There have been changes from generation to generation, of course, with the Honor 9 downsizing the screen by the smallest of amounts to squeeze in a new panel with minimal side bezel. It makes for a smart, trim handset that easily fits into the one hand - unlike the slightly-too-wide Honor 8 Pro which preceded this smaller 9 by a mere few months (a strange release schedule, we're sure you'll agree) - although it's barely any different in size compared to the original Honor 8. The most obvious shift between generations is the Honor 9's inclusion of an oblong-shaped ceramic fingerprint scanner to the front; the Honor 8 had a rear-positioned circular one. This new scanner apes the front position that almost every brand is going for these days. It works really well in terms of response - even if the rear position made more natural sense to us, as that's where the index finger naturally falls when gripping the handset. In addition to fingerprint unlock, Honor has implemented a gesture control system too. It's not activate by default, but when it is switched on it means a press of the scanner functions to go back within the software or app that's open; a longer press goes to the homepage; while a swipe from right to left will open the current apps screen. It's a reasonable implementation of gesture, but we prefer the distinctive two-way swipe system to which we've become accustomed in Motorola phones, such as the Z2 Play. With a 5.15-inch screen, the Honor 9 avoids that giant scale that so many phones with upwards of 5.5-inch panels typically possess. It's quite a refreshing change, as it's easily accessible and eminently usable with just one hand. The screen isn't going to break any technical boundaries, though. With its Full HD resolution LCD panel, it can't quite muster the ultra-deep blacks of OLED, while that resolution isn't as pixel dense as the Quad HD competition. Does that matter? No, not really. The Honor 9's screen is plenty bright (although not HDR compatible, if that's your bag), viewing angles are good and colours pop convincingly (even if it's not got the widest ranging colour gamut, such as the latest LG G6). These minor criticisms are of little relevance when considering the Honor 9's price. Few sub-£400 phones will offer higher resolutions or more party tricks than available here. Speaking of party tricks, Honor has baked in two levels of touch control: knuckle-based commands can be used for different actions than simple finger-based swipes (a feature that we rarely to never use, given how hit-and-miss it is). What's really impressive about the Honor 9 is just how heavyweight its hardware is. This phone is every bit as powerful as the Huawei P10 Plus for a cut of the price. Our review model pairs the company's HiSilicon Kirin 960 chipset - Huawei's most powerful offering - along with 6GB RAM and Mali-G71 MP8 graphics. Which reads rather well, but how does it all perform? Day to day - and we've had the Honor 9 in hand as our personal phone for two consecutive weeks - it's really good for opening apps at pace, navigating around pages and running various apps. In this regard it feels flagship. However, it's not perfect. There's a lack of fluidity to some graphics, such as the in-between level animations in Candy Crush Saga - a game that runs more consistently on the less powerful Moto Z2 Play. So it's not always what's on the spec sheet that matters, it's the way a device responds in day-to-day use. The Honor is about 90 per cent there. Still, we'd have no qualms about throwing some of the more demanding Play Store titles at this phone, as there's nothing bad enough to infuriate. On the battery front the Honor 9 squeezes in a 3,200mAh cell, which makes it approximately seven per cent more capacious than the 3,000mAh cell in the Honor 8. The newer phone is obviously running more demanding hardware, but newer software, so the resulting difference isn't a gigantic bump by comparison. Unplugging a fully charged phone at 8am would see the battery drop to around 30 per cent by 9-10pm, meaning a solid 13-14 hours of use without worry. It's not got the stamina of some of its competitors - including the OnePlus 5 and Moto Z2 Play - but there's enough juice on board for a standard working day. Furthermore there is an additional battery-saver mode which throttles CPU usage but, in our experience, doesn't add enough value to feel worthwhile. It seems to add minutes rather than hours of use time. If you do need to top-up at the plug then the inclusion of QuickCharge via the USB Type-C port means double-quick charging. In the lower half of the charge than can mean just 20 minutes at the plug can add hours of use time. Handy if you're in a rush. We did find the phone to get quite hot as a result of this charging method, however. As Honor is effectively Huawei, the Honor 9 utilises the company's EMUI 5.1 software. That's short for “emotion user interface”, if you were wondering… enough to bring a tear to the eye, eh? In this iteration it's a skin over the top of Google's Android 7.0 operating system, which gives it a strong base and plenty of the standard Google features, including Doze battery saving when the device is out of use for a given period of time. Over time EMUI has improved dramatically by cutting back on the non-stop alerts that plagued earlier versions. The software is very battery conscious, which is great in some regards, but overzealous repeat alerts about apps using more power than others can become irksome. Fortunately this alert basis can be tinkered on an app by app basis, but this all takes time before the system is running smoothly in a more personalised fashion. Part of the purpose in having a bespoke piece of software is to add additional features. These vary from the knuckle-based controls we mentioned earlier - which we don't find very helpful at all, as they're tricky to activate each and every time - to split-screen, screen record and more. Unlike Huawei, however, Honor offers various opt-in apps when firing up the phone for the first time (Wowcher, Gumtree, Hungry House HelloFresh and more in the UK). And you have to accept at least one to be installed, which feels like forcing its hand on the bloatware front. Apps can be deleted after installation, however, so it's not a total killer. Overall EMUI 5.1 is decent.Problem is, it doesn't look quite right by default and the Themes really aren't that pretty. For a phone with such an exuberant exterior there's scope for improved icon design and colour choices to, well, bring it more in line with stock Android (but, then again, why not just go with stock in the first instance?). The last major piece of the Honor 9 puzzle is its dual camera system. It's possible to shoot either colour or true monochrome snaps, just as it is in the Huawei P10, although the Honor lacks the Leica certified lenses and the software, therefore, is a touch different. In addition to colour and mono, the dual lenses can also be used to capture a depth map and produce software-based background blur - otherwise known as bokeh - for supposedly more pro-looking shots. As with any manufacturer that offers such a system, it's imperfect, better suited to more defined subjects far from their backgrounds. For more complex scenes it can render things a bit of a mess, especially when looking at the shots in 100 per cent detail (something that's often not seen on a small-scale screen). As straight-up cameras, however, the Honor 9 is a solid performer. It's not the best solution going, as images are over-sharpened in processing to counter apparent softness, but shoot in good light and the results straight from camera are natural looking and well exposed. Ability in lower light is also strong; we've shot in record stores and venues and when the image sensitivity rises the black definition remains strong and image noise is well concealed. Functionally the camera performs well too. Tap the screen for focus, which will result in the focus circle quickly adjusting as it finds subject focus. From here exposure compensation can be made to lighten or darken the exposure by dragging around the circle. There's also a Pro Photo Mode - various modes are selectable via a left-to-right swipe when the camera app is open - which opens access to manual settings, such as white balance, to take more creative control. It might not have the Leica certification of the Huawei P10, but overall the Honor 9 performs much the same throughout, making it a solid performer for its asking price. As a logical progression, the Honor 9 makes a stack of sense. For Huawei, however, we can't quite grasp why the parent company would undercut its own P10 model in such clear fashion. But from a consumer point of view that doesn't matter: the Honor is the better phone, not just on account of price. Our complaints are only minor quibbles. For the next Honor device to achieve perfection all it really needs to do is smooth out the graphics and user experience, then it will be an unstoppable brand in the affordable phone market. Now, that's quite the turnaround from its starting point. Longtime king of the affordable phone, the larger OnePlus 5 isn't really in the same price bracket as the Honor 9 any more. But if you have some extra cash on hand then, well, it's still a formidable device that's worth of its many accolades. Want something a bit larger? The slimmer, wider and more resolute Pro model is akin to an iPhone 7 Plus in many regards - but without the considerable price point to boot.